96 percent of Microsoft's revenues come through its partners. 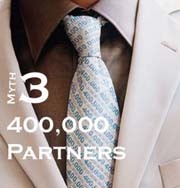 Those partners sell 350 Microsoft products. 400,000 members belong to the program. Every $1 that Microsoft makes from sales of Windows Vista generates $18 in related revenues for partners. Over the next few pages is RCP's guide to these sacred numbers: where they come from, what they imply from Microsoft's point of view, what they actually mean and what key caveats you need to keep in mind about them. We've chosen to call them "myths" here -- not in the modern sense of the word as a convenient fiction, but in the spirit of the larger-than-life story that takes a kernel of fact and embellishes it to express bigger truths. Sit through a slide deck or a keynote on the Microsoft Partner Program, and you'll see or hear this figure or one of its variants (we've heard 92 percent and 94 percent, too). It's often presented in a way to suggest that Microsoft's billions in revenues are nearly all channeled through its hundreds of thousands of partners. The implication: Join the partner program and you become the tap through which Microsoft's abundant revenues flow (and presumably, you wind up with a share of those revenues as well). Things aren't that simple. In fact, Microsoft probably does get at least 90 percent of its revenues from partners, but most of that comes from a few dozen major OEMs such as Hewlett-Packard Development Co., Dell Inc. and Lenovo, and transactional partners such as large account resellers, distributors and direct market resellers. The vast majority of partners stand outside this flow of money, motivating customers to buy Microsoft-based solutions but building their own revenues on supplemental software, hardware and services. A new Influence Program goes a little way to give Microsoft a way to recognize those partners that are driving business to the transactional channel. 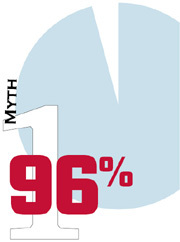 The 96 percent figure provides an upper boundary for Microsoft Services and Microsoft's direct sales. For all the recurring concerns among partners about whether Microsoft is going to steal their consulting business or beat partners in direct sales, the company receives only 4 percent of its revenues directly from customers. That means that, of Microsoft's $44 billion in revenues for fiscal 2006, all but $1.76 billon would have come through partners. While the 96 percent figure is ambiguous, it expresses this truth about Microsoft: Partners of all stripes are vital to Microsoft's revenues and growth. As Julie Bennani, the new general manager of the Microsoft Partner Program, put it recently: "Partners are so critical for our business ... Partners are really our sales force." 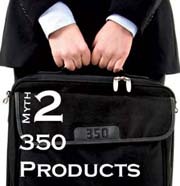 It's often said that partners sell 350 Microsoft products. That statement isn't hard to believe when you consider that, for starters, there are five main versions of Windows Vista and four editions of Windows Server 2003. Based on the sheer number and variety of Microsoft partners, it's safe to say that somebody is selling every Microsoft product. But the number of partners selling Xbox 360 games is limited mostly to major retail chains and Web sites, and MapPoint probably isn't accounting for huge buckets of partner revenue. The bulk of partner activity, similar to Microsoft's revenue patterns, boils down to Microsoft's five products that each account for at least $1 billion in annual sales: Windows desktops, Office, Windows Server, Exchange and SQL Server, plus a few other products like Microsoft Dynamics and Microsoft Office SharePoint Server that are moving up fast. One of the most important realities about the Microsoft Partner Program is its scale. While the total membership figure varies (and has been increasing every year), the most recent bottom line is 400,000 partners at the Gold Certified, Certified and Registered Member levels. This number both understates and overstates the program's size. On the one hand, not every Microsoft partner belongs to the Microsoft Partner Program -- in fact, not even every significant partner is a member. When Microsoft officials talk about the number of partner companies worldwide, they've cited numbers as high as 600,000. On the other hand, not all Microsoft partners bring in much business and some deliver none. While the 30,000 Certified and Gold Certified partners are unquestionably committed -- they must demonstrate specific criteria and pay annual membership fees -- the 370,000 Registered Members pay nothing to register and some don't even necessarily qualify as channel partners. After all, registration brings access to what's been called the best deal in the business: the Microsoft Action Pack, which includes business software, training materials, and sales and marketing tools. Every vendor's partner program has a certain amount of dead weight. No matter how many Microsoft partners are tagging along just for the Action Pack, Microsoft still runs what is probably the biggest channel program in the industry. The ratio represents the amount of money partners make for every $1 Microsoft gets from Windows Vista. This number appears often in Windows Vista-related messaging, but it's threatening to become one of those figures that floats free of its context and can be stretched far beyond its meaning. The source is a December 2006 white paper developed by analysts with Framingham, Mass.-based IDC and sponsored by Microsoft. IDC's exact phrasing was: "For every dollar of Microsoft revenue from Windows Vista in 2007 in the U.S., the ecosystem beyond Microsoft will reap $18 in revenues." Specifically, IDC estimated that those $18 would be spent as $9.75 for hardware, $4.60 for software and $3.65 for services. To derive the figure, IDC used its internally developed Economic Impact Model that it has been using industry-wide in independent research for several years. IDC's data model seems solid and the company's research has integrity even when it's vendor-sponsored. Just remember that this ratio applies to Vista, not other Microsoft products, and that more than half of the revenue in the ratio comes from hardware.